Enormous boards covered with wedges of cheese, delicate meats, and colorful fruits are trending. Instead of spending hours cooking, assembling a cheese board—as simple or extravagant as you wish—is a quick and easy way to bring people together to share the tasting experience. They’re both visually pleasing—as much so on your kitchen table as on your Instagram feed—and easy to build. Still, the variety of cheeses and supplements, along with the process of laying them all out on a board, can overwhelm a beginner. Where to start? An expert can help. Elizabeth Chubbuck’s passion for cheese led her to become senior vice president of sales and marketing at Murray’s Cheese in New York City. Here, she offers tips for building your perfect board. 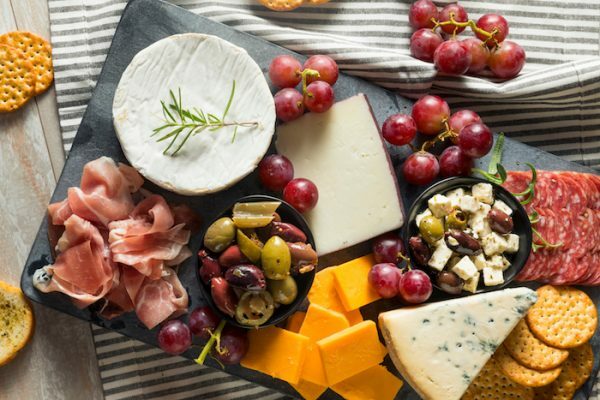 According to Chubbuck, there are four types of cheeses to consider when putting together a board: a cow’s milk, a goat’s milk, a sheep’s milk, and a blue cheese. For those who don’t want to use a blue, it can be replaced with a stinky washed rind or leaf-wrapped option. There’s a direct relationship between the age and texture of the cheese: The older the cheese, the firmer it will be. As it ages, it loses moisture and hardens, often becoming crumbly or grainy, and also turns sharper and stronger in taste. Younger cheeses tend to be softer and milder. They can be consumed in larger portions and are more popular melted for cooking. Chubbuck’s three staples are a soft manchego, a firm Comte, and a blue cheese. She might also throw in a wheel of bonne bouche, a creamy, ash-ripened goat’s milk from Vermont Creamery, as her optional fourth. For people who are new to the world of cheese, she recommends starting with a four- to six-month-old manchego, a common sheep’s milk cheese from Castilla La Mancha, Spain that tastes like buttered popcorn. After feeling a little more confident, people can be convinced to try something like a 10 to 14 month-old Comte, a firm, Alpine-style cow’s milk cheese that has a slightly smoky, grilled flavor. For fans of softer, more luscious cheeses, a young goat’s milk cheese, a Camembert-style cheese, or a Brie would be great additions. Cheese can be eaten with a variety of accompaniments to enhance the tasting experience. There are three classical pairing principles. The first is that like goes with like: Foods with similar characteristics go well together. Try fatty, salty cheeses with fatty, salty nuts. A young, nutty Manchego is traditionally eaten with marcona almonds that have been fried and sprinkled with sea salt. Opposites attract, too. Sweet or acidic fruits, like grapes, pears, and kiwi, contrast nicely with salty cheese. A classic Spanish snack pairs membrillo, a sweet and tangy paste made from the quince fruit, with manchego. But Chubbuck loves it with all kinds of cheese, “because it has a nice, warm, spicy quality to it as well,” she says. Honey is another of her foolproof pairings. It goes well with any cheese, but especially goat’s milk varieties, as their salty tang balances well with the honey’s sweetness. The last principle is that what grows together goes together, the idea behind terroir-based pairings. Foods that grow in the same places often share similar properties that make them compatible pairs. For example, wines from the Burgundy region of France tend to couple well with the region’s cheeses. Principles aside, Chubbuck also offers an unusual favorite pairing: kimchi and blue cheese. “Any spicy kimchi paired with a rich, fatty, blue cheese tastes a little bit like buffalo chicken wings with blue cheese dressing,” she says. After getting the basics down, it’s time to start putting it all together. The size of your board depends on how many people it is expected to serve. If only a few friends are invited over, Chubbuck may just serve one cheese with a few pairings and call it a night. A larger group calls for a bigger, more appetizing board. Serve about 1 1/2 ounces of cheese per person. Chubbuck builds her boards freestyle, with no systematic way of laying out the elements. In one demonstration, she starts with a wheel of Murray’s Greensward to act as a centerpiece. The washed rind cow’s milk cheese has a silky texture and a hint of bacon flavor. She fans out triangular slices of Comté around it, and stands crackers up in between the slices. Skewers of peppers, cornichons, and olives placed over the cheese add the finishing touch. The completed board can be served alone, or complement a bigger one. 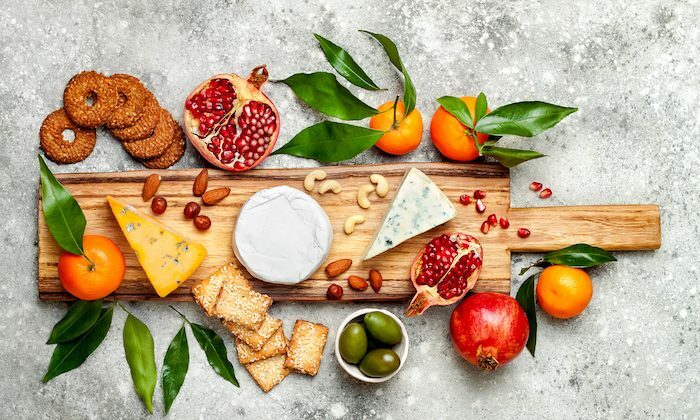 For a fancier board, Chubbuck starts with one or two large centerpieces that act as anchors, before placing smaller cheeses and pairings around it to add details and different textures. “It’s like a cheese mandala,” she says. The key to a beautiful board is to create visual diversity with a variety of shapes and colors. Mimolette, a bright orange cheese that resembles a cantaloupe or pumpkin, makes for a fun starting point. Prosciutto or salami add pink to the board. Paper-thin dried orange crisps can top slices of young manchego, both contributing color and helping achieve the tangy-fatty balance. And beautifully colored radishes, raspberries, and cornichons add further pops of color and flavor to the assembly. Finally, crisp crackers are arranged around slices of cheese to act as their vehicles. The idea is to have everything in one place, to make the board look inviting. When it’s time to feast, Chubbuck likens a cheese board to a choose-your-own-adventure book. People can experiment with different pairings, and discover what suits their tastes.